COUNTRY - CITY € per sq.m. € 120 per sq. m.
Prime London: Belgravia, Chelsea, and Knightsbridge. Other London: Kensington, Bayswater, Notting Hill Gate, St. Johns Wood, Highgate, Islington, and Primrose Hill. Monaco is the most expensive location to buy an apartment in Europe. Closely on its tail is Prime Central London, where 120 sq. m. super-luxury apartments can cost €1,170,000 or €9,750 per square metre (sq. m.) (in Euro: €1,742,656, or €14,522 per sq. m.).Apartments of 120 sq. m. in other luxury areas of Central London are likely to cost €580,000 or €4,833 per sq. m. (€863,880 or €7,199). The large difference is explained by London's highly segmented top-end market, with super-luxury apartments in absolutely prime areas commanding considerable premiums. Paris and Amsterdam follow London. A 120 sq. m. apartment in either of these cities has an average purchase price of €800,000 (€6,667 per sq. m.). Moscow is Europe's sixth most expensive capital for buyers of residential property. And though apartments in Moscow can be rather rewarding for buyers in terms of rental income returns, investors should be aware of the high risks (purchases are cash-based, and the authorities can suddenly turn hostile). Dublin makes an appearance among Europe's most expensive cities in 10th place, with a high end 120 sq. m. apartment on average costing around €600,000. The Baltics, till recently Europe's hottest residential investment destination, are now expensive. A high-end apartment in Central Vilnius, Lithuania will cost on average around €3,792 per sq. m (€455,000 for 120 sq. m.). Latvia follows closely with high-end apartments in Central Riga costing an average of €3,020 pr sq. m. Rental yields in the Baltics have also dropped to very low levels. There are still some very inexpensive capitals in Europe. Berlin, in particular (€3,167 per sq. m.), is now experiencing inflows of foreign money in response to its relatively low prices. But much less expensive are Slovakia's Bratislava (€1,292 per sq. m.); Warsaw, Poland (€1,175 per sq. m.); Skopje in Macedonia (€1,125 per sq. m.) and Chisinau in Moldova (€917 per sq. m.). It is to be expected that foreign buying in some of these capitals will accelerate. The rental returns on owning apartments in Europe vary greatly - from around 14.13% in Moldova's capital Chisinau, to 2.43% in Monaco. The trend is for rental income returns to fall, because rents are not keeping pace with prices anywhere in Europe. As 2007 dawns, rental returns are lower in most locations than they have been for 20 or more years. To some extent rental returns appear to correlate with risk. Most of Europe's 'high yielding' countries are in the East. Apartments in four Eastern European capitals earn above 10% rental returns: Chisinau, Moldova (14.13%); Warsaw, Poland (13.28%); Sofia, Bulgaria (10.56%); and Bratislava, Slovakia (10.06%). The higher risks of the East may be a factor in these returns (high corruption, political risks). But risks are not the only factor. The Global Property Guide believes that the relatively recent arrival of the market economy, high interest rates, and relatively undeveloped mortgage markets. To illustrate, it would surely be hard to label the historic city of Bratislava, Slovakia, as a high-risk location, yet the rental income returns are excellent. Property in Prime Central London returns surprisingly high rental yields, at 7.13%. Note that this 'Prime' category encompasses relatively a narrow group of super-luxury apartments in absolutely prime areas (Belgravia, Chelsea, and Knightsbridge). The high returns in these select locations contrast with the significantly lower rental yields (5.79%) available in Central London's other luxury areas (Kensington, Bayswater, Notting Hill Gate, St Johns Wood, Highgate, Islington, Highbury, and Primrose Hill). Nowhere in Europe are rents keeping pace with the continued rise in property prices. This is cause for concern. At the Global Property Guide, we informally consider a danger signal to be rental returns of around 4% or below. 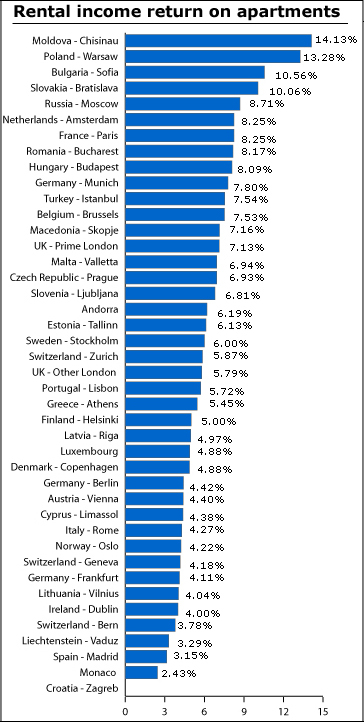 Several European capitals offer rental income yields around or below this 4% level. An example is Madrid, where rental returns are now at only 3.15%. What do different-sized apartments cost? How much you could earn from small or large apartments in: London, Berlin, Paris, Istanbul, Riga, Vilnius, Tallinn, Bratislava? How high are the transaction costs when buying property in different European countries?